How long your tyres last has a lot to do with your driving style. 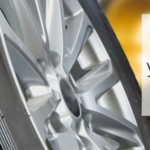 A tyre that's in good condition has signs of even wear across the tread and wall of the tyre. Uneven wear can signal bigger problems with the car itself so it is worth keeping an eye on the wear of your tyres. It is normal for front tyres to wear faster than rear tyres but as a rule, tyres should be replaced every 5-6 years at least! most people will change their tyres after 10,000 - 50,000 miles depending on how you drive.